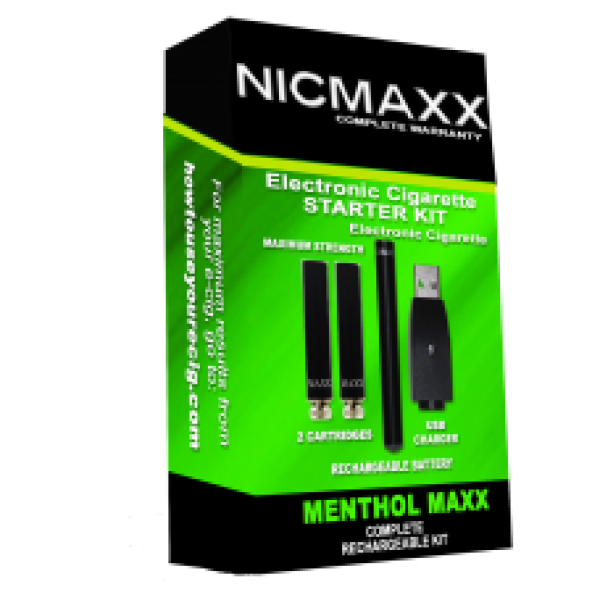 E Cigarette Starter Kit Menthol: Cool and Deliciously Refreshing! Menthol is a popular flavor among vapers because of its cooling and soothing effect. Tobacco smokers who have switched to vaping also like menthol because it reminds them of the familiar and satisfying taste of their favorite cigarette brands. Flavor is one of the reasons why people who want to quit smoking prefer electronic cigarettes over other options such as quitting cold turkey, nicotine gum, and nicotine patches. With e-cigarettes, you get to experience what you love about smoking without the harmful side effects of tobacco. Since flavor is an important part of the vaping experience, you need to choose the best-tasting vape juices. NICMAXX offers a variety of flavors at the lowest prices. It’s the one-stop solution to all your vaping needs! NICMAXX’s menthol flavor produces a thick, full vapor with a uniquely smooth finish. This flavor is perfect for long-time smokers who are interested in switching to e-cigs. Our Menthol Cartridge offers the same look, feel, flavor, and nicotine delivery of a traditional Menthol cigarette, but instead of tobacco smoke, it emits a flavorful but odorless vapor. Nine out of 10 smokers actually prefer NICMAXX after tasting their flavors. Give NICMAXX a try! You might never want to go back to smoking cigarettes after trying our flavors. Studies have already shown that cigarette smoking can be very dangerous to your health. This habit also leads to bad breath and ruined teeth. E-cigarettes don’t have the same harmful chemicals that lead to oral health problems. However, if smoking has already done its damage to your teeth, you can always trust Ryoo Dental for dental restorations. NICMAXX’s e-cigs are customizable. With our e-cigs, you have complete control over how much nicotine goes into your cartridge and how much vapor you get per puff. This means you can gradually decrease the amount of nicotine you want in your cartridge until you reach zero. Once you get rid of your nicotine addiction, you’ll never miss your filthy cigarettes again! Vapor is less offensive than cigarette smoke. Electronic cigarettes are designed to reduce the risks associated with traditional cigarettes. In e-cigs, tobacco is replaced with nicotine liquid, so the smoke produced when you use it is a clean and odorless vapor. NICMAXX’s cartridges are also devoid of harmful chemicals that non-smokers hate such as carbon monoxide, tar, arsenic, ammonia, cyanide, and acetone. Cigarette smoking is harmful to nearly every organ in the body. Your lungs suffer most every time you inhale the chemicals and carcinogens from your cigarette smoke. Smoking also increases the risk of coronary disease, stroke, and lung cancer. Quitting significantly reduces your risk of getting serious health problems in the future, and many people have successfully quit smoking by switching to electronic cigarettes. NICMAXX offers a variety of flavors to make your vaping experience more enjoyable. Once you find the flavor that suits you, it will be a thousand times easier to ditch your cigarettes! We offer free shipping on orders over $75. Check out our flavors and see the difference. 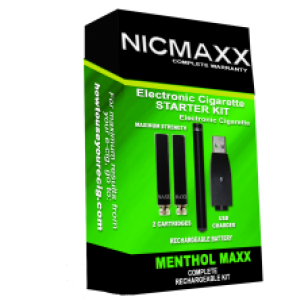 Buy a Menthol Electronic Cigarette Starter Kit today and make the switch!